R is for Rajin – or as you probably know him, Raiden. Japanese parents sometimes warn their children to guard their bellybuttons from this god. Apparently he likes to eat them, although this is more likely a characteristic of his demon counterpart, Rajiu, who appears as a wolf or fox. Raiden turns up in all kinds of pop culture – dozens of cameos in video games, animes, even in a female form in Joss Whedon’s Angel – but he’s probably best known for his starring role in the Mortal Kombat series. Again, this week’s story isn’t original myth, but has its roots in the mythical character, with a lot of influences from pop culture images. Raiden sat in the centre of the Todai-ji temple, straw hat pulled far over his eyes. However much he meditated, he could not change the truth. And he could not see a way forward. The Lord of Outworld had stolen the Dharma. Without it, men would find it much harder to achieve enlightenment. Some would never be able to without the guiding counsel, written by the first of the 28 Buddhas. The Lord of Lighting raised his head, and quirked a white eyebrow. So it was proclaimed that there would be a tournament, to find the most skilled warriors in the world. Many came from China and Japan and even from far-off America. There was even a woman. As they fought under the watchful eyes of the Lord of Combat, some won, some lost, and some died. At last there were but eight left. And the Lord of Lightning cast an enchantment, that the whole force was transported to the demon-infested Outlands. And because they could not otherwise return, they fought the demon-folk. And there were many other demons, each with their own form, and the Eight Warriors fought and defeated them all. And seven of the eight fought, with Lord Raiden. And the eighth, seeing that all were distracted by the fight, drew on the way of the ninja, and stole the book of the Dharma from the throne where it was. And the ninja read aloud from the 7th Discourse, where it says that Man is the last life before Nirvana, and man who dies with honour …. The floor of the arena opened, and became a portal to the Realms of Men. And because of the inspiration of the book, the demons could not pass through. So came home triumphantly the Warriors of Men. But Lord Raiden was to get no rest, for he must ever guard the Dharma from demons and evil men, who seek to turn its power to their own ends. Many settings have the god of lightning and thunder as evil, or at the least neutral but violent. A benevolent lightning god is the perfect patron for fighters of evil forces; whether armed with swords, bows, or even arcane magics. He might even bestow elemental magics on his followers. 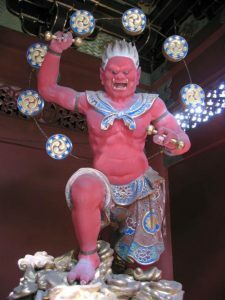 Shinto shrines might feature a statue of Rajin, but they would be unlikely to be full of treasure and guarded by monsters. Monasteries on the other hand, might have ancient holy books, special weapons or armor, or finely crafted artworks; and be guarded by little old men with brooms. What is the Dharma? When you need to consult it, how do you choose to defeat Raiden, and whatever other guardians he is currently employing? You could fight him, try to persuade him, or even sneakily steal it. When you have it, who else is seeking it – and will now pursue your protagonists? 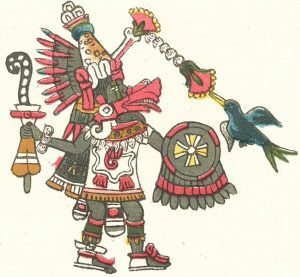 Quetzalcoatl, as depicted in the 16th century Codex Magliabechiano . The Feathered Serpent is god of the wind and learning. He serves as a messenger between worlds, and as the guide for vision questing. As with many of the Mesoamerican faiths, Quetzalcoatl is a composite of disparate local gods. Some of his assumed roles are then parcelled out to his close relatives. His twin brother Xolotl takes his role as messenger to its logical conclusion, as a psychopomp – a guide of souls to the afterlife. Rather a lot of what we know about the Mesoamerican faiths – principally Aztec, Tolmec, and Mayan – is extrapolated from limited archeological evidence. Much useful data was deliberately eradicated by European conquerors. The latter part of the story is now believed not to actually be Aztec myth, but to be a misinterpretation, written later by European scholars, who were inclined to see the Aztecs as brutal savages. Politeness on the part of the king was, in that society, a show of dominance – think of an extension of ‘cool guys don’t look at explosions’ – or the icy politeness of the classical Bond villain. So in calling Cortez divine, Moctezuma was actually insulting him. Story – the Herald of the End Times? When the world was made, the gods needed a great source of energy to power the world. So they made the sun, but it was incomplete. It needed a god to go into it to give it his lifeforce. During this age the people were giants, and ate acorns.There was a fight, the sun was damaged and Tezcatlipoca in his rage sent jaguars to kill all the people. During this age people were made again, in the size they are now. But in one of his rages, Tezcatlipoca turned all the people into monkeys and Quetzalcoatl send a hurricane to blow the monkeys away. During this age they tried again to make people. But the king stole Tlaloc’s wife, and in his grief Tlaloc refused to send the rain, and drought killed most of the people. During this age, Tlaloc’s sister tried to be the sun, but she was too heavy, being gravid with many children. So the sun fell out of the sky, and flooded the earth, and most of the people died. And there was the Fifth Sun, which is the sun we now have. This is the shy god Nanahuatzin. He nearly didn’t become the sun, but his naughty brother Tecuciztecatl pushed him, and fell after him, and got badly scorched. Now he lives in the moon, still burning, and nursing his burns. At the beginning of the Fifth Age, Quetzalcoatl chased the demon Huitzilopochtli away into the sky, with the promise that he would return to aid his people when he was needed. And the sign of the ending of the Fifth Age was the return of Quetzalcoatl, not in his form as a feathered serpent, but in the form of a man with pale skin. In the meanwhile, the people should do all they could to sustain the Sun in his great labours. In particular, they should cover their great places in gold to reflect the sun’s light further, and they should sacrifice lives to sustain the sun in his work. The city of Tenochtitlan had been successful in its wars, and had sacrificed many enemy warriors to strengthen the sun, and their gold was taken and clothed the city, and the king, and the priests. And one of the warriors was scouting in the forest, and he saw in the distance a group of half-men half deer – or so he believed them to be. We know that the men were Spanish, and riding horses, and that their leader was called Cortez. And the warrior brought the pale man to the king Moctezuma. The Aztec people welcomed the Spanish, thinking that they were the people of their god. The Spanish explained that the Aztecs. So the king set his scholars to work to learn the language of the god people. The scholars soon gained understanding of the meaning of the Spanish demands. And when the Spanish asked for gold to be brought, a mighty pile of the precious metal was assembled in front of the Temple of the Sun. What more natural than that the god’s people would require his substance in the world? In celebration of the return of the god, Moctezuma held a great sacrifice. But the Spanish, not realising the importance of sustaining the sun, slaughtered the Aztec people and priests and lastly the king, butchering him on the top of the temple. And the Spanish took the gold and sailed away, leaving behind them the ruins of the city Tenochtitlan. We call the place Mexico now, but there can still be seen the site of one of the greatest misunderstandings of all time. The mythical city of El Dorado, the bustling metropolis of Tenochtitlan – temples to the Aztec gods were vast and grandiloquent. Whilst not literally built of gold (it’s too soft) they would likely be gilded and filled with treasures. Exploring them could be either whilst they were operational – in which case be careful not to be caught and offered as a sacrifice, or as ruins – anyone for Indiana Jones? The other thing the Aztecs are renowned for is their ball game. They used it as a means of selecting the best of their warriors to sacrifice, but it could equally be a war-substitute, or a selection for some dangerous mission. Are the gods invoked in the arena, or is the one place they cannot influence – and why? Quetzalcoatl as a patron could grant all kind of sensory spells, from darkvision or echolocation, to clairvoyance, to vision questing. He is likely to be worshipped by mystical scholars – particularly those of the Things Man Was Not Meant To Wot variety. An interesting set of adventures could be set in the times of one of the other Suns. What are the people like? Could you save them from their catastrophe – and should you? Ok, I’m cheating. 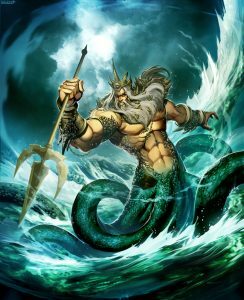 I don’t know enough gods that begin with P – given that we’ve used Neptune (aka Poseidon) for N I’m short on good stories. There are far too many gods that begin with A – Artemis, Athena, Ares, Apollo and Amphitrite in Greek myth alone. So in order to fit to a neat alphabet, we’ve needed to look at some gods under their other names, or their assorted titles. He is god of the sun, healing, archery, hunting, athletics, music and the arts, military scouts and prophecy. He inspires the Oracle at Delphi, and slew a great monster there, Typhon. He is also responsible for plagues and famines – or preventing them. He is the defender of flocks, and by extension colonists – the Colossus at Rhodes was a great statue invoking his protection for the colony. He ruled over various Games – both athletic and dramatic competitions, most of which were festivals to Apollo and another god – the Thargelian Games was devoted to Apollo and Artemis, whilst the Olympics were dedicated to Apollo and Zeus. Despite this wide range of domains, Apollo doesn’t feature in all that many myths. Even where he does show up, it’s often in cameo, fulfilling the plot role of Gandalf – to give the quest and quickly leave, in order for the heroes to complete it. So this is one of the few tales in which Apollo has a starring role. It’s another one of my blends of myth and fiction, but I claim the tradition of the Greek playwrights who first recorded these stories – where detail was insufficient, they made it up, based on the characters involved. After all, such dramas were originally part of the worship of the Greek gods – designed to convey the stories of the gods to a largely illiterate populace. As patron of the arts, Apollo must surely approve! Troy was little more than a village when Laomedon came to power as its king. There were a profusion of bandits in the area,and the town could not prosper unless they could protect their wealth. The king sent his daughter Hecuba to consult the Oracle, and she returned with instructions for a great sacrifice. For many days the town was not visible from the beach for the smoke. Through the smoke came a trio of builders, who promised to build the highest walls the folk had ever seen, in three days – but only if they were not watched. For two days, all was well. The people trusted to the compact their king had made. But the king’s daughter Hecuba, being ever curious, sneaked away on the third day to spy on the builders. She hid in a place she had played as a child, near where the great city was being constructed. And this is what she saw. Apollo played his lyre, which had been made for him from a tortoiseshell by Hermes, and the stones danced into place. Poseidon waved his trident, which controlled all the seas, and mud from the sea floor mortared the stones together and Artemis breathed on the spaces in the walls and the great wooden gates grew in their places. And in three days the walls were builded, strong and tall, with watchtowers and gates and guard rooms. Spells granted by Apollo are wide ranging – priests might be generalists or might be a sub-cult of specialists – Specialists in healing might follow Apollo’s son Asclepius, whereas combat support might be more a cleric-ranger than cleric-fighter and might follow his archer aspect Aphetor. Animals associated with Apollo, suitable for summoning, are lizard, wolf and raven. Apollo had a monotheistic cult (more usually rendered Apollon) Interesting political shenanigans might ensue between a polytheistic cult and a monotheistic one – one being god of most things and the other god of everything. One being open to “your sun god is basically our sun god” and the other evangelizing that they have the only true path. Followers of Apollo are likely to be as diverse as his aspects. You might come across a fellow believer willing to help you, but equally a vizier type character might be opposed to your protagonist without necessarily being evil. Think Cardinal Richelieu – he genuinely believes that his gaining power is good for the French State. And he may even be right. Osiris is God of wheat and resurrection – this may seem like a strange combination, but to the ancient egyptians it was obvious: they buried dead wheat in the expectation it will live again, as a new crop. 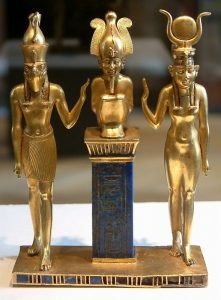 Most of the worship of Osiris focused around this dichotomy, that the Lord of Life is also the First Mummy. Osiris, however, is the gentler brother. He is usually shown with a crook and a threshing flail – not only for his connection to farming, but also as the shepherd of men – the example that men are supposed to follow to live moral lives – and on death, Osiris rules paradise, and is only joined by the righteous. Early communities of monks – although very different from communities we would recognise today – shared a ritual meal of unadorned bread, in order to identify themselves with Osiris and gain part of his immortality. Such Houses of Life became centres of healing lore and may have been the earliest hospitals. The story this time is less of a ‘known tale’ and more a composite from what we know about burial practices. Isis may or may not have written the Book of Going Forth – which tends to be known as the Book of the Dead. It seems poetically appropriate for her to have written it, so I decided she did. As has already been told, Osiris was treacherously slain by his brother Sutekh. After conceiving him an heir, the falcon-headed Horus, Isis went to bury her husband. At this time, people set the bodies of their loved ones to sail down the Nile to the sea, where their ka – their immortal souls – became the crew of the ship that carries the Sun. But Isis had a dream that she should not set Osiris on a boat, but carry him instead into the desert. She wrapped him in cloth she had woven with her own hands and laid him on a bed of rocks. She sent word to everyone who grieved at the death of the Lord of Life, that they should come with a stone to place on the tomb. And they came. Each with a burden suited to his stature – the rich and powerful brought mighty slabs, and the poor brought handfuls of pebbles. Each was piled into a great pile, and such was the wisdom and skill of Isis, that the body was not crushed. For forty days she stayed there, and dreamed the journey Osiris took. Then Isis rose from her place by the pyramid, and went forth and wrote down all her dreams, in the book that has become the Book of Going Forth, telling how to make such pyramids, that the souls of the mighty would serve Osiris in his kingdom of the Dead, and fight with him to defend the world against the Outer Darkness. Then she walked back into the desert, and left her son to rule in Khem. Osiris walked a long walk, through all the places he had known in life. He came at last to the great throne of the Goddess Ma’at, who is Justice. As the sun set in the Underworld, as it rose in the world above, Maat plunged her hand into the chest of Osiris, and plucked out his heart. Osiris’s soul was weighed and came out as light as the feather. And his journey was ended, that he became king in Aaru, and daily battles to preserve the world, for it is the kingdom of his heirs and his people. Temples to Osiris were grand and complicated – often resembling a small province, when one includes the supplying farms, sacred lakes, outlying shrines and so forth. But temples are not the best source of dungeons in Khem. Burial chambers – whether pyramids or the catacombs inhabited by less royal people – were protected by all manner of curses and traps. Looting them could be worth it, as even quite poor people took many goods with them to the afterlife. The priesthood would have been agricultural managers, and societal planners. Ancient Egypt had many people who were described as ‘priest’ but few of them would qualify as clerics, and they had almost no traditions of paladins. Temples were guarded more by tradition than monsters. Osiris might grant his priests all kinds of spells of healing, but allied to this are the secrets of raising undead, particularly mummies. Animals associated with Osiris are locusts and scarab beetles, but also all kinds of food animals. For priests who choose spells of fertility, a well-timed stampede of cattle can be just as dangerous as any lightning blast. I’ve decided that a good time to talk about the pair is right at the center of the month2)Or a few weeks before the start of the month, but my time machine is out of fuel. so that’s when this is going out. Naga are a category of powerful beings in a variety of Indian and south asian mythology and folklores. Spread over such a wide area, the tales of Naga come in many forms, with only one definitive trait – their serpentine nature. 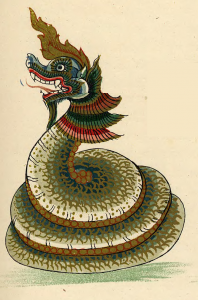 Though Naga are often depicted as evil, or even demonic, this is far from universally true as many Naga’s actions veer towards the helpful – whether they are many-headed water guardians or malevolent shapeshifting serpents they are universally both powerful and dangerous, imbued with strength and venom. Indra, King of all Deva, was riding upon his elephant when he happened across the great sage Durvasa Muni. Out of respect for Indra’s position the sage offered him a gift, a special garland that had once belonged to Great Shiva. Indra knew that he was considered an arrogant god, and so he decided that he would not immediately wear this great gift, but instead he set it aside upon his elephant’s tusk. His elephant, Airavata, saw that Indra wished to prove himself humble, but he knew that that humility was false – and so he took the garland from his tusk and threw it upon the ground. Durvasa was enraged that Indra had allowed such a thing to happen to a religious offering, and so he cursed Indra and all of the Deva to weakness and frailty. Due to this curse, the Asura (the Devas age-old enemies) were able to overcome the Deva’s defences, and conquer their realms. In desperation the Deva went to Vishnu and requested his aid. He offered them an opportunity to acquire the Nectar of Immortality, while overcoming their hated foes, and they eagerly agreed. In order to obtain the Nectar of Immortality they had to churn the Ocean of Milk that lay at the pole star, and this would require two great armies to achieve. But first they would require tools to do so. As a churning stick they used a mountain, but to turn this mountain they needed a great rope – and following Vishnu’s advice they asked Shiva for his necklace. This necklace was Vasuki, one of the three Kings of the Naga, and possessed of a great gem embedded within his head. As Vishnu had foreseen the Asura insisted on standing at the head of Vasuki where they could be close to the glittering gem, while the Deva followed his advice and took hold of the Naga’s tail. As they churned the ocean, Vasuki began to exhale sharply, and from his mouth came the most virulent poison in all of creation. The Nectar had only begun to form when the Asura collapsed, overcome by the venom – but as the Deva began their collecting they soon found that they too were being overcome. Indra, realising that his people were now in even graver danger, rushed to Shiva and asked for his aid. Though he knew how destructive the venom was, and that it could kill even gods themselves, Shiva chose to inhale it all to protect the rest of creation. Only the intervention of his wife Parvati saved Shiva from death, by preventing him from swallowing the poison. Instead, the poison sat in his throat, eating away at it until his throat turned blue. At Artemis Games we’re generally somewhat perfectionist about our products, and as such we have no real intention of making a full-fledged game in a month – we’re just plain not good enough to meet our own standards that quickly without just reskinning someone else’s work.5)While we have made games that quickly for Concept Cards they were mostly variants of standard playing card games – fun extras, but not something we’d have been happy releasing as a standalone game. But that’s not to say we aren’t participating – neither NaNoWriMo nor NaGaDeMon are about making a complete final product from scratch, they’re about getting things a few stages forward. This month me and Loz are each focusing on a different project. I have brought Clash of Blades back, written up its rules in full, and intend to have the first two base decks ready by the end of the month. Meanwhile Loz has taken on a rather different project, currently codenamed Clash of Brains6)It originated from someone mishearing Clash of Blades, a semi-cooperative game in which the players are psychics surviving in a zombie-infested college, each with their own bonus objectives but all seeking to put down the apocalypse before their precious (and powerful) brains become more Zombie-Chow. We’re nearing a thousand words, so I’m going to call it here, but I’ll be back with more information on both projects when they’re further along. In the meantime, join us on Facebook. 2. ↑ Or a few weeks before the start of the month, but my time machine is out of fuel. 5. ↑ While we have made games that quickly for Concept Cards they were mostly variants of standard playing card games – fun extras, but not something we’d have been happy releasing as a standalone game. Neptune is god of all the waters – seas, rivers and springs. He also has jurisdiction over horses, and by extension, travellers. For the Greeks, Poseidon was one of the most important gods – the brother of Zeus. and key to their coastal and island world.To the Romans, Neptune was less central – being a land-based rather than marine economy. But he was honored by certain segments of society – in particular, there was often a shrine to Neptune in any fort occupied by cavalry. Like all the Classical gods, the Roman Neptune accepted sacrifices. He was honored as one of only three gods who accepted bulls (the others being Mars and Apollo) His temples were often found by springs and wells, or in tandem with Mars, or Minerva (with whom he made the first chariot), or as part of the three brothers of Earth Sky and Water – Pluto, Jupiter, and Neptune. Possibly because of his multiplicitous origins – as a fusion of the sea gods of Sparta, Athens, and the Etruscans – Neptune has many spouses, and hundreds of children. This can be seen as symbolic of many rivers reaching the sea, each with their own guardian spirit. Wikipedia lists eighty, and other sources suggest more. There is also some indications that he may have also had male lovers. The story I’ve chosen has Neptune (actually, Poseidon, but the two are closer than most Greek / Roman pairs) as an antagonist, but as well as being the father of monsters, Neptune also had a role as a protector from them. He is almost alway pictured with a trident, with which he was said to stir up storms or earthquakes, or calm them with the pommel end. Perseus was flying across Greece, carrying the head of the Gorgon Medusa in a bag. As he flew low over one coastline, he saw a figure by the sea. Thinking it to be some statue, he swooped down for a closer look. As he drew near, he saw the statue move as the cold waves sprayed over it, and he saw that is was no statue, but a young maiden, chained to the rocks. “Why are you chained out here?” asked the hero. Perseus felt that this was most unfair. He sat and talked to the maiden, calming her fears, and receiving her promise that he would battle the monster, but she should look away from the fight. Andromeda tried to dissuade him, but heroes are hard to persuade. As the monster appeared on the horizon, Andromeda closed her eyes, sure that the monster would tear Perseus apart, and not wishing to see such a horrid sight. Perseus, being careful to avert his eyes, drew forth the Gorgon’s Head. It still retained its powers of petrification, and the sea-monster was turned to stone. Taking good care not to see it himself, he stowed the Head in its bag. He drew his sharp sword and split the chains binding Andromeda. And the hero carried her away, with his winged sandals, and lodged her with some peasant folk he trusted, before continuing with his quest. Neptune’s followers were anyone who depended on the sea – not only fishermen and sailors but pirates! Not all pirates are from the Caribbean, there are stories of piracy from the Classical world (Julius Caesar was famously captured by pirates, and his escape and punishment of them is the beginning of his path to greatness) all the way to modern day pirates smuggling guns and drugs. Spells he might grant would include summoning of sea creatures or water breathing, and water control. As Lord of both the sea and horses, he is also master of all kinds of spells of travel – from phantom steeds to flight to interplanar travel. Neptune himself is powerful, but he has whole tribes of people at his command – nereids, merfolk and tritons. Any of these could appear as protagonists, antagonists or support characters – what strange wares might a merman merchant carry? For a city that might be blessed by Neptune, check out The Floating City jigsaw piece. We’re back with the Celts, who love their goddesses in threes. There are three goddesses of Ireland – Eriu, Banba and Fotla. Three goddesses of fertility – Brigid, Boann, and Etain. And three battle goddesses. Morrigan is sometimes one of these, and sometimes the sum of all three. Her sisters are Badb and Macha. Modern witches tend to clump all these goddesses into a single triumvirate – the Maiden, the Mother, and the Crone. Not all sets of three neatly fit, but there are enough similarities for wiccans to represent the primal forces in this simpler fashion. In this way, they seek to conflate goddess-aspects from many pantheons, to better understand them. When Maeve stole the cattle of Ulster, all the men but Cuchullin were struck by a weakness. Cuchullin was only immune because he was only half a son of Ulster – half of his heritage was divine, being a son of Lugh. So Cuchullin stood at the ford where the great river runs which borders Ulster, to fight against the champions of Maeve in single combat. The Morrigan in the guise of a beautiful blond girl, came to offer him her love, and her aid in the battle. But Cuchullin rejected her. So she went away and changed into the form of an eel. At the height of the fight. she tripped him, and he wounded her, but he won despite that. So, Morrigan came again in her guise as a wily red headed girl and offered him magical aid in the battle, and her loving embrace. But Cuchullin rejected her. So she went away and came back in the form of a wolf. At the height of the fight. she scared cattle over him, and he wounded her, but he won despite that. For the third night, Morrigan came in the guise of a dark haired beauty, offering strength for the coming battle, and loving rest in her arms. And again Cuchullin rejected her. So she went away and came back in the form of a red heifer. At the height of the fight. she led a stampede of cattle over him, and he wounded her, but he won despite that. So, after the battle Morrigan appeared in the form of an old woman bearing the three wounds he had given her, and leading a cow. So Cuchullin knew that what faced him was one of the Tuatha de Danann. She offered Cuchullin a draught of milk, and he blessed her for it. His blessing healed her wounds, and in return she had nothing but the prophecy of his death. Castles belonging to followers of Morrigan would tend to be defended by puzzles and traps rather than monsters – unless you count hordes of fey warriors. Seek her in hollow hills and remote crags – or in Annwn, the Celtic Fairyland. Morrigan could also appear in a political tale, in her role as outsider and observer. She might well know secrets unavailable elsewhere. But what price will the Lady of Fate require for her aid? Perhaps, like the blood-price for the Sons of Tuirenn, it will sound innocuous and be the source of a whole adventure to find. If you’re looking for more Fae Fantasy, join Artemis Games Jigsaw Fantasy Patreon and put in your vote. L is for Loki – and for Loz’s birthday, which would be why this week’s Mythic Monday is in fact a Tuesday. Loki would doubtless approve of the departure from routine for he is the Norse god of all things odd. Trickster, shapeshifter, wizard – he is the archetype for scalds – living by his wits. Loki was rarely worshipped in his own temples – his cults would generally be based out of a shrine in temples to Thor or Odin, or occasionally Freya. His priests were consulted for the workings of Fate – Loki is sometimes seen as a lover of the Norns. Currently, the picture in most people’s head is of Tom Hiddleston’s portrayal of Loki, from the Marvel Cinematic Universe. It’s worth remembering that Loki is different to his fellow Aesir – whether you take the option that he is a Vana – the Norse proto-gods – or a Jotun – or even just that he is marked by his experiences. So anyone who complains that Hiddleston is too dark to be a Norseman, needs to think about why Loki looks different. Of course, how Loki is perceived – as a friend and helper, or as a foe, rather depends on where in the narrative you look. Loki is rare amongst gods in that his character develops – from the slightly naughty trickster to the leader of the armies of Ragnarok. One day, Loki, being bored, suggested to Thor that they might go exploring in Thor’s chariot. With their friend, Hjalfi, they rode across the mountains, drawn by four goats. They found themselves at a mighty castle, as night was drawing on. At the gates was a giant, who named himself as Utgarda. Loki boasted of he and his companions, that he could eat faster than any other, that Hjalfi was faster than any other, and that Thor was stronger than any other. So a trencher was set for Loki and one of the giant’s people, Logi. It was filled with meat, and each began to eat, and they met at the middle. However, Loki had eaten only the meat, whereas Logi had consumed the bones and the trencher as well. Hjalfi was set at a race against a figure called Hugi. Three times they raced, and three times Hugi beat Hjalfi. So Thor offered a drinking contest, and a great horn was brought. Three great draughts drank Thor, but he was unable to finish it. Angered, Thor offered to fight anyone there. Utgarda offered only his old nurse. Try as he might, Thor could not wrestle the old woman to the floor. Utgarda laughed, and all went to bed. The three travellers slept in a wide bed, which appeared soft, but they slept restlessly. Loki woke in the morning, and stood at the gates of the castle. “Show me truth!” he proclaimed. And truth he saw. He saw that he had competed against Wildfire, that Hjafi had raced against Thought, that the draughts of ale Thor had drank were the sea, and had caused the tides, and that the woman Thor had wrestled was Old Age, whom no man can master. And the bed they slept so restlessly in was the bed of the sea, and they had caused great waves. And the castle was no castle, but a mountain. And Loki told the others what he saw, and they returned to Asgard a little wiser. Loki is a trickster, but he is still a Norseman. He might grant spells of concealment or illusion, but he also might give you strength to fight when your tricks go wrong. His association with ice giants – the Jotun – gives him access to all kinds of elemental magics, particularly cold-based ones. There might not be many temples to Loki for dungeon-delvers to explore, but as a father of monsters, his priests might defend their homes and castles with all kind of beasts – in particular wolfkind or dragonkind. 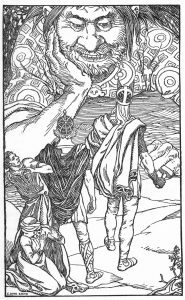 Many of the Norse myths feature Loki as a trouble stirrer – see Balder – and either Loki himself, or his adherents – priests, warriors or scalds (bards) – could show up in any story to cause chaos. However, Loki also sees much through his magics, so such meddlers might also have information useful to adventurers. There’s one week left to back our Jigsaw Fantasy Patreon if you want to pick up the Panoply (and Pantheon) of Annem Ka at a discounted rate. Kronos is the King of the Titans. The Titans were not so much worshipped as feared. They are the primeval forces of nature. A few are benign – Metis, Thought, becomes the mother of Athene, and Themis is the personification of Justice – but most are terrifying and dangerous. The Sea, the Sky, The Sun and Moon, concepts like war and destruction, and assorted local fire-mountains (remember, the Eastern Mediterranean area is volcanic) They cannot be wholly tamed, merely overruled by the Olympian gods. The Titans may well represent the lingering deities of the Phoenician culture that inhabited parts of what is now Greece before the Mycenaeans, which we think of as the Classical Greeks. Kronos himself suffers from confusion with the Roman Chronos, who is Old Father Time. There’s no kind of clarity whether they’re the same deity or two different ones, because different Classical writers treat the matter in one of three basic forms. He’s either Cronus or Kronus or Kronos (as with many periods of history, spelling in the alphabetical systems was inconsistent – most things weren’t written down so those who could write had to work out certain words for themselves) He is the husband of Gaia, or her son, or both. I’ve gone with the son version, because it fits with most of the common tales, and makes the following story make more sense. In the beginning was Chaos, and Chaos brought forth Gaia, which is the Earth, and she brought forth Uranus, which is the sky. And Gaia and Uranus married, and had many offspring – giants and monsters of all kinds. And the greatest of these was Kronos, and Rhea was his wife. Uranus displeased his wife however, for he did not care for all of her children. The Hekatonkheires and the Cyclopes displeased him with their strange forms, and he threw them into Tartarus where he would never again have to look upon them. Kronos was the only of Gaia’s children both strong enough and brave enough to fight against the tyrant Uranus, and so he freed his imprisoned brothers and sisters and marched against his father, striking him down and castrating him with a great stone sickle. Kronos was not content however – he knew that the Cyclopes and Hekatonkheires were willing to fight against their lord, and he was now their lord. And so he repeated the actions of his father and imprisoned them in Tartarus. It was this act that led his mother Gaia to prophecy that as he had repeated his father’s crimes he would repeat his father’s death – Kronos’ son was destined to overthrow him. So as his wife Rhea gave birth to each child he swallowed them whole. 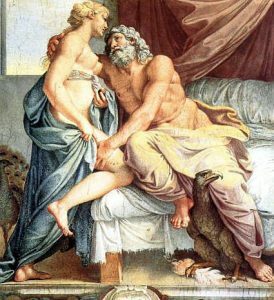 When Zeus was born, Rhea could take it no longer and so she bundled a stone in swaddling clothes and handed it to Kronos, hiding the boy on Crete. Zeus grew until Crete could no longer hold him, and Zeus went to rescue his brothers and sisters. He wrestled with Kronos until he could force an emetic on him. His disgorged brothers and sisters then launched a vast war to overthrow the Titans, armed and equipped by the Cyclopes. When the Titans were dead or subdued, the Olympians carved up the universe between them. Zeus became King of the Sky, and his brother Poseidon became Lord of the Sea. The third brother Hades became Lord of the Underworld. Their sister Hera became queen of marriage and childbirth. Demeter took the growing of crops for her domain, and the last sister Hestia claimed sovereignty over the Hearth. Kronos was imprisoned in Tartarus below the earth. There he waits, scheming revenge against his son, and the mortals who are ruled by him. Summoning the Big Bad Thing is a favourite of cultists and sorcerers everywhere. Whether a Titan, a Great Old One, or a more earthly monster, the Big Evil is usually a ritual to be interrupted. For an excellent example of this kind of titanic struggle (sorry) in gaming, take a look at the Age of Mythology: Titans expansion. On the other hand, what if the party are trying to get rid of a god? It’s possible that summoning such Things might be necessary if the aim of the plot is deitycide. Of course, one you’ve summoned it, there’s no guarantee that Kronos will do what you ask – he is a force of nature. And how does one breach the walls of Tartarus anyway? Some of the myths provide another reason one might wish to bring back the Titans – During their rule humanity was stronger, freer and more moral than the people of the modern world. The Titans, unlike the gods, felt no need to interfere in the lives of mere mortals and their power flowed more freely into the world. The Titans don’t have clerics or paladins, but some settings might see them as the granters of elemental magics. Kronos is majestic, and so might indirectly grant spells of mastery or even metamagic. But he is unlikely to commune directly – more likely there is some quality of the power that binds him that allows his power to be siphoned. Juno is the Eevee of Roman gods, constantly evolving in different directions. She started out as Hera, Greek goddess of marriage and childbirth. But when adopted by the Romans she collected titles – Capitolina reflected her role as patroness of the Roman State; Moneta from her connection with the moon – the word money comes from this root, as the Roman mint was part of the temple complex. The differences between the two goddesses reflect differences between Greek and Roman women. Greek women were often required to stay virtually imprisoned in the gynaeceum – the women’s house. Athenian women had limited rights to property, while Spartan women had much more developed rights. The Romans adopted the Spartan model – women could own property, and often had considerable social influence. Juno has a martial aspect – protecting the vulnerable – and hence appealed to by those law officers who protect and serve. Anyone whose role is defined by those whom they serve – from PAs to social workers to viziers – might have cause to call on Juno. Because of her role in childbirth, no knots were permitted anywhere in the temple – a problem if you had no belt! Knots were believed to hinder a woman’s birthing – and hence wearing any would negate any favour from Juno. 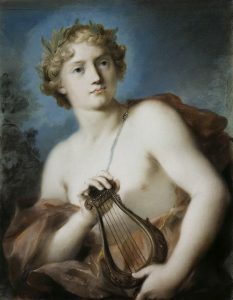 Hercules was the result of one of Jupiter’s many affairs, and incurred Juno’s hatred by the very fact of his existence. She resolved not to let this one grow up, to confound her vengeance. So, she sent a pair of serpents to his cradle. The infant Hercules strangled one in each hand, doubtless while burbling and giggling. To try to protect him, his mother sent him away to be raised by peasant strangers. Hercules grew big and strong. He married and had two children. His life might have been peaceful. But eventually Juno found him, and sent a fit of madness such that, when he saw his wife approaching, he perceived them as enemies and slew them. As penance for killing his wife and children, he was made to serve his half-brother, the cowardly King Eurystheus. He slew many monsters, captured others, and last of all borrowed Cerberus the faithful hound of Pluto. Hercules was drinking and telling tales with his friends, and Juno caused Deinira to think that he was with another woman. She gave him the shirt, thinking it a magic charm to restore his love. But the shirt was a deadly poison, and unable to remove it, Hercules threw himself into a river, in an attempt to cool the fire, and drowned. His deeds were so great that Jupiter declared that he would be received onto Olympus. Even Juno had to be reconciled to his divine self. She didn’t like it much, and he spent much time away – appearing in the dreams of heroes to inspire them to greater deeds. Juno the jealous has more reason to turn up as the patron of adversaries than protagonists. She might support an order of police-ly paladins, but she’s more likely to be called on by the duke’s right hand man – or his wife. She would likely grant clerical powers of protection – or perhaps poison as vicious as her temper! As demonstrated in the above story she also had a tendency to use underhanded means and illusions to punish those she disliked, often tricking their loved ones into betraying them. Those who have angered Juno have cause to fear their allies as well as their enemies. Geese guarded her temples, which were relatively simple in plan. Other buildings might be supported by the temple nearby – priest houses, farms to raise sacrifices, the mint… add in the location of the temple in the centre of the city, and a raid on a temple of Juno might more resemble an urban heist than a dungeon crawl. Juno’s holy day – the Matronalia.- was early March. A festival dedicated to respect for all women, and by extension all relationships seen as valid by that society, could be the jumping off point for all kinds of intrigue stories – by defining and celebrating what is proper, we also define what is taboo. Taboo means secrets, and what will people do – or have adventurers do for them – to protect those secrets?